I thinned down my collection of cycling jerseys when we came home to Kuala Lumpur. Among the jerseys that I kept were my local club jerseys. The camaraderie that those jerseys represent makes them near and dear to me. “Club” sounds a bit formal. “Group” is a better word. My first cycling group was West End. So named because our rides started outside the West End Bicycles shop on Blossom Street in Houston, Texas. The shop owner, Daniel Murphy, told me about the group and the rides that they do. There are Tuesday and Thursday evening rides that start at 6.30 pm, and Ted’s Taco Ride on Sunday mornings. I met Daniel not long after I started cycling. In my days of riding my Trek 7.5FX hybrid bike in my baggy shorts, t-shirt and tennis shoes. My first ride with the West End group was spectacularly unsuccessful. I got dropped within the first few kilometers. Dropped so badly that I lost sight of everyone’s tail lights. I didn’t know the route so I had to go home. The next ride went much better. Largely due to a few riders hanging back to make sure I didn’t get lost again. I can’t thank them enough for that. The West End group introduced me to riding further than 16km / 10mi in one go, how to change a flat tube, what to bring with me on a ride, and the culinary delights of Jax Grill and Doña Maria. 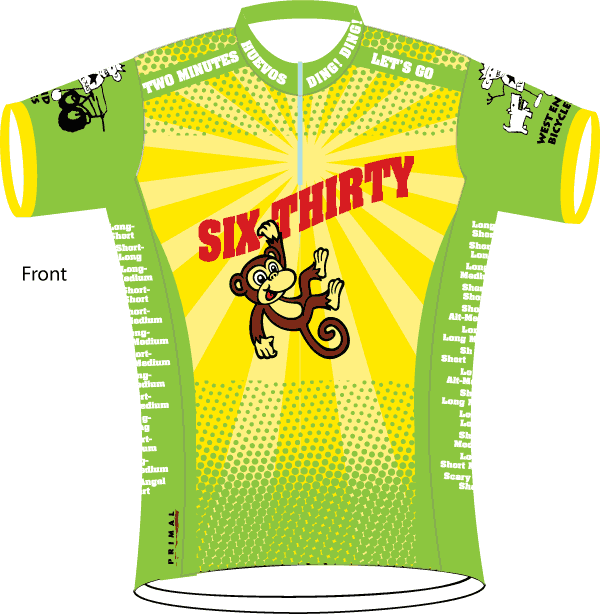 West End Bicycles sold these jerseys. I know about Frank, the dearly-loved and sadly-departed shop cat. I don’t know anything about the dog in the shop logo though. I can tell you that the West End group lives up to the motto on the collar. Fast and Friendly. There have also been a series of 6.30 jerseys. Including this one, which I no longer have. I donated this jersey, along with others, to an aid organization in Den Haag. Perhaps someone is still sporting this jersey somewhere in South Holland. It took a while to find a group to ride with in Den Haag. All the Dutch cycling clubs that I encountered were very serious. In the typically Dutch way they were very well-organised and had excellent facilities. They were also geared toward the competitive rather than the recreational cyclist. Some even required that you met a qualifying time for membership. Ride 40km / 25mi in an hour for instance. So a year had gone by before I heard of the Not Possibles. A group made up largely of expatriates living in the Den Haag area. Weather permitting, the Not Possibles meet outside the DAKA sports store in the Leidsenhage shopping center on Saturday mornings. The route for the day often depends upon the prevailing wind, and is usually about 40 to 60km / 25 to 37mi long. Th group was described to me as one that rode at a pace between 20 to 25kph / 12.5 to 15.5mph. I learned on my first ride with them that this was not strictly true. They averaged about 25kph / 15.5mph for the entire ride. Including the slow rolling start from Leidsenhage, the stops at traffic lights and the slow rolling through built-up areas. I spent most of my first ride with the Not Possibles frantically trying not to lose sight of the tail end of the group as it sped through the trees in the dunes. This struggling on the first ride was becoming a bad habit. A few months after I hooked up with the Not Possibles we decided that we needed group jerseys. This is what we came up with. The Not Possibles introduced me to routes north, east and south of Den Haag (west was not possible because the North Sea gets in the way), riding in the rain, harnessing a tail wind for 60km / 37mi and taking the train to get home, and the delights of apple pie and coffee at the Coffee Club. 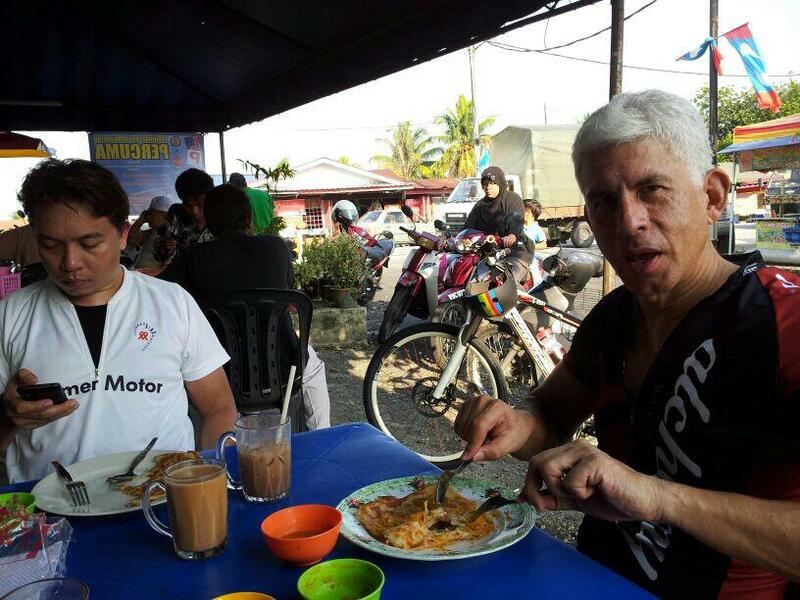 I hooked up with a group of cyclists within a few days of arriving in Kuala Lumpur. As soon as my bikes arrived I was off on a ride with the Racun group. “Racun” is the Bahasa Malaysia word for “poison.” In this case the name refers to how people are poisoned by the cycling bug. One bike becomes two bikes becomes three bikes. Every bright and shiny new accessory becomes a must-have. The name is especially appropriate because the Racun group are linked to Van’s Urban Cycling Co. Where new temptations are constantly presented. Like the new Knog Blinder Road light. I am not the only one in the group who is sorely tempted by this light. The Racun group has introduced me to the world of folding bicycles, urban night rides, breakfast at Sharif Roti Canai, and orange + green apple + lychee juice. Van’s was sold out of the original yellow and black Racun jerseys. 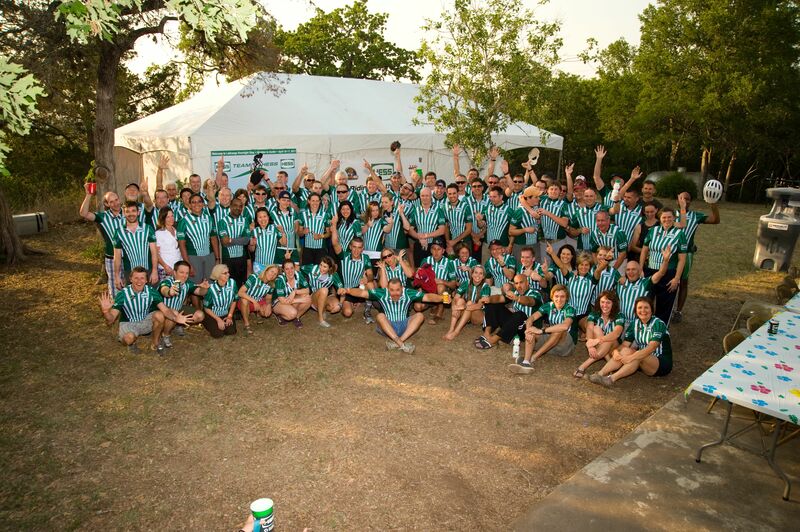 Fortunately for the new joiners a second batch of jerseys was made up. The jerseys may be different, but they represent the same things. A love of cycling, fun and friendship. I fly these colors with pride. 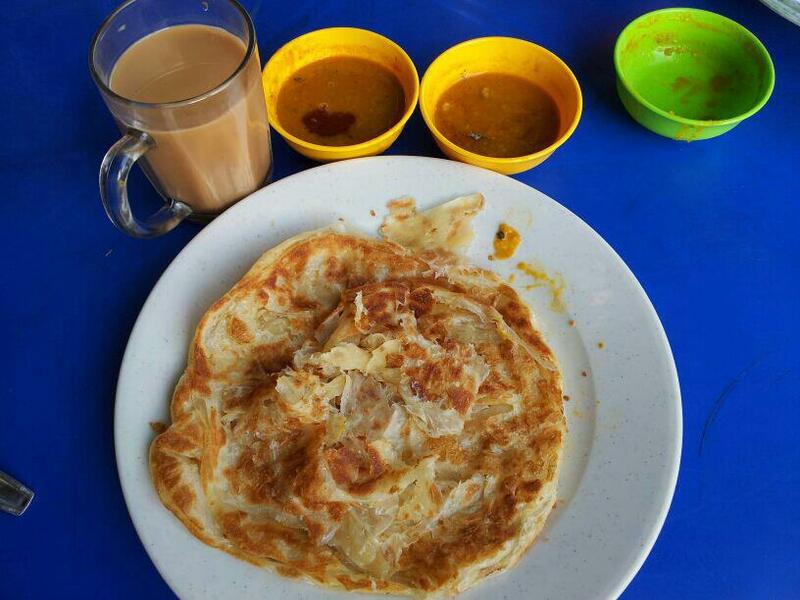 Posted in Cycling in Malaysia, Cycling in Texas, Cycling in the Netherlands, Gear and Tools and tagged Den Haag, Dona Maria, Houston, Kuala Lumpur. Jax Grill, Racun, Sharif Roti Canai, The Coffee Club, The Not Possibles, Van's Urban Bicycle Co, West End Bicycles. Bookmark the permalink. 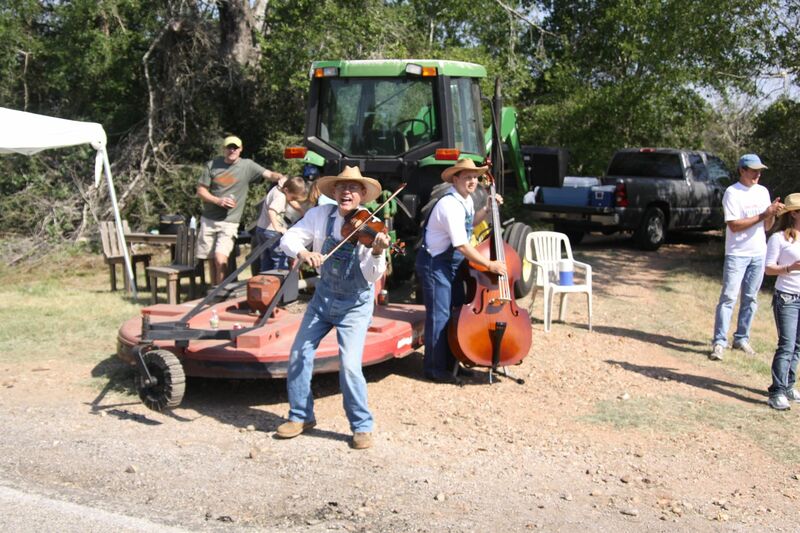 The lead up to this year’s BP MS150 ride from Houston to Austin was faultless. Barbara collected my rider pack and Hess jersey for me. Malaysian Airlines and KLM got me to George Bush Intercontinental Airport as scheduled. Tom and Donna were waiting outside Arrivals for me. The Omni Houston Hotel at Westside had my room ready. Most importantly Fedex had delivered my Ritchey Break-Away bicycle to the hotel. The first thing to do was to put the bicycle together. My bike came with a Ritchey torque key that fits the 4mm bolts on their bars and stems, as well as the bolt on the hinged clamp that anchors the flanged joint on the down tube. Steve Dodds at Bicycle Doctor USA had told me to pack an 8mm Allen key to install the crank with. I also packed 6mm and 5mm Allen keys for the seat post and saddle mounting bolts. Four Allen keys and a pump were all I needed to get the Break-Away ready to ride. The plan was to do the Thursday evening ride with the West End 6.30 group. That would have been the perfect shakedown ride for my brand-new bike, if not for the rain that afternoon. Instead Tom and I made do with a quick 8km / 5mi loop around Memorial Park on Friday. If that short spin was anything to go by, the Ritchey Break-Away was going to serve me very well. The ride quality was everything I expected from a titanium frame. The SRAM Force group set shifted precisely. The brakes had good modulation and stopping power. I didn’t expect problems during the ride to Austin but we stopped at West End Bicycles to get the bike inspected anyway. It is worth getting an official inspection sticker. If I did have a problem during the ride I would receive free labor for repairs. The weather when I arrived on Thursday was unusually cool. When we started the ride from the hotel at 6.30am on Saturday morning it was unseasonably cold. It was 4°C / 39°F. That was a record low temperature for April 20th. The previous low was 6°C /44°F set in 1901. Needless to say in my group I was probably the least appropriately dressed for the temperature. I was riding with Barbara, Laura, Dane, Joe, Skip and Tom. Everyone was cold, but I was chilled. It had warmed up by the time we got to the lunch stop at Belleville, but not enough for me to take my jacket off. Barbara and Dane kept their arm warmers on, unlike Laura and Skip. Relatively normal temperatures for the time of year were restored by the time we got to the stop at Industry. West End Bicycles was operating their customary service stand there. Complete with yummy snacks. There was time for a post-cookie fist bump with Tom before we hit the road again. Fayetteville is always a treat to ride through. The residents come out in force to cheer the riders on. And ring bells and blow whistles and generally carry on. We had an additional treat in store for us at Fayetteville this year. 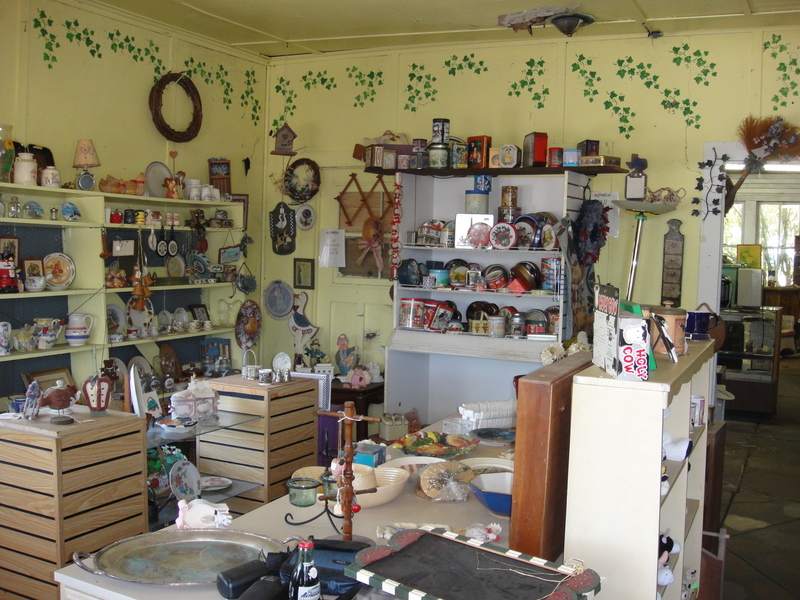 Skip knows a lady who runs an antique store out of a converted gas station. 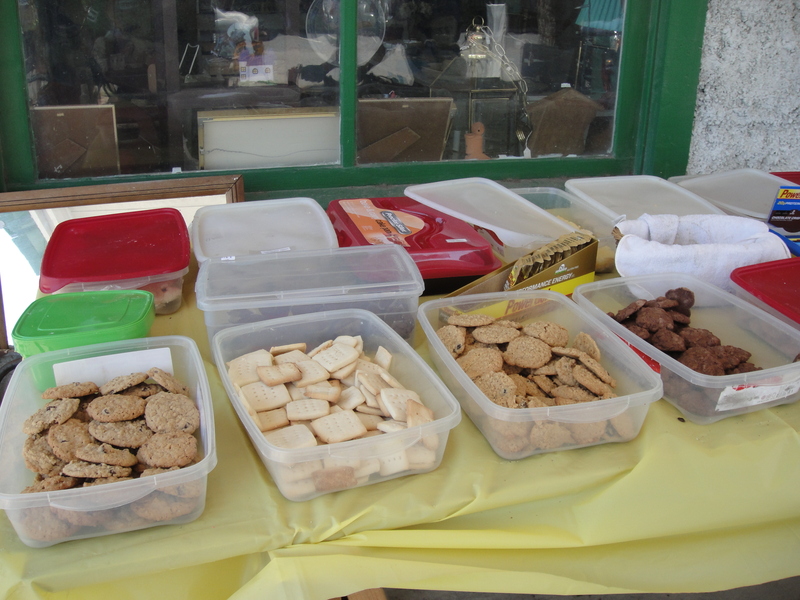 For MS150 day she bakes all sorts of cakes and cookies which she lays out for anyone who wants some. Not everyone knows about this though. So hooray for Skip and his insider knowledge! We had about 30 km / 18.5 mi to go to La Grange. Dane headed out ahead of the rest of us. His plan was to get to the VFW Hall early enough to reserve prime sleeping spots for us all. We wanted a row of six camp beds near a wall socket. We all had electronics that needed recharging. We didn’t get the row we had hoped for, but we were near a coveted wall socket. This is Tom watching Dane get sorted out after their turns in the private shower truck that Hess provides for its team. 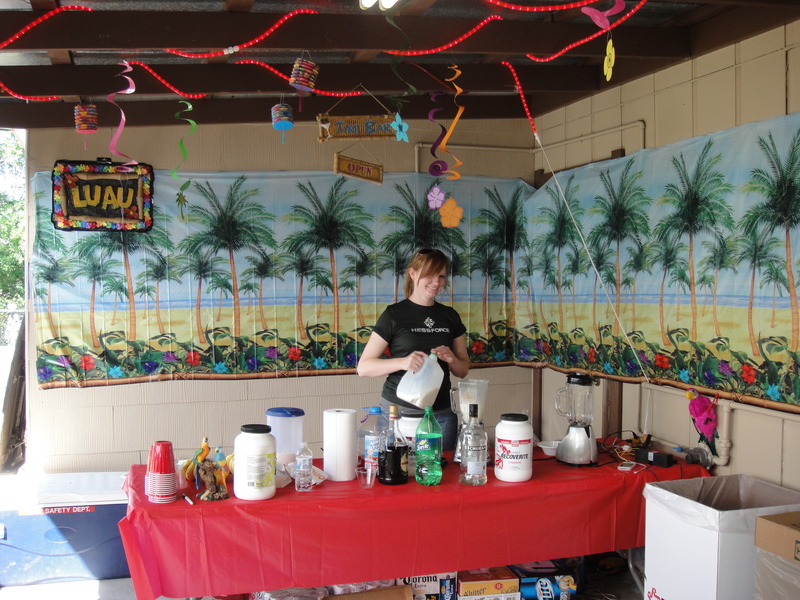 This year the Hess bar featured recovery drinks made to order. Just the ticket after a hot shower and before a massage. We are all spoiled by the excellent support that Hess provides to its riders. Air-conditioning, private showers, indoor toilets, an open bar, ear plugs in case the snoring gets too loud. I’m not sure how we managed when we rode with other teams and had to endure conditions like this. Tom, Skip, “Sideshow” Dane and I went for a wander around the Fayette County Fairgrounds to stretch our legs before dinner. We had ridden 160 km / 100 mi. That made it my longest Day One in the three times I have ridden the BP MS150. I was still a bit jet-lagged and very ready to call it a day as soon as I had finished my dinner. Day Two wasn’t far away. 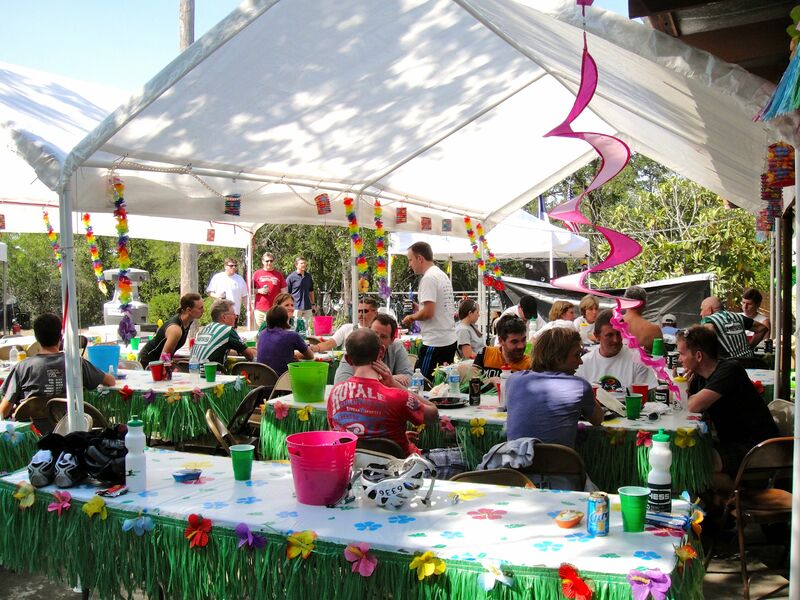 The National MS Society is still accepting donations linked to this ride. The society is depending upon your generosity to raise as much as possible to put toward the search for a cure for multiple sclerosis. Please click on the link below to make a donation to this worthy cause. 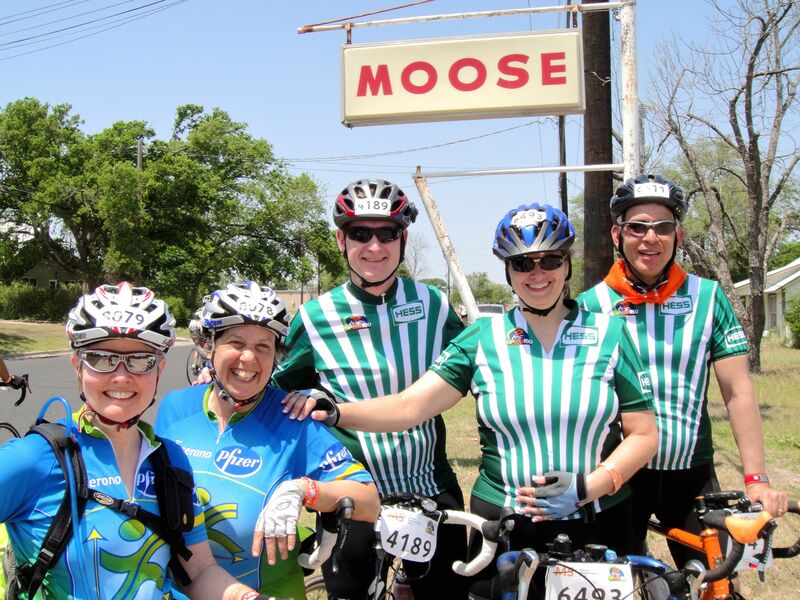 Posted in Cycling in Texas and tagged Belleville, Bicycle Doctor USA, BP MS150, Fayette County Fair Grounds, Fayetteville, Hess Corporation, Houston, Industry, Ritchey Break-Away, West End Bicycles. Bookmark the permalink. I thought about cycling technology during the ride along the Shah Alam Expressway the other night. Specifically about how much bicycle lights have evolved since I last bought one. My thoughts were prompted by how the spot cast by my headlight paled next to that coming from Chon’s headlight. I had also noticed that Mark’s rear light was so bright that I had to avoid looking directly at it. Not an easy task when you are on his wheel. 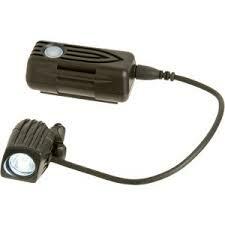 The first bike lights I bought, in 2008, were from Cateye. They came in a set. They looked something like these ones. I say something like these one because these are the current models. The HL-EL 135. I don’t remember my headlight having three LEDs (light-emitting diodes) like this one. What I didn’t realise at the time was that Cateye designed this headlight to be seen by others, and not to help the rider see what is in front of them. To their credit Cateye makes no secret of this in their 2012 Headlight Chart. In 2009 I started riding regularly at night with the West End Bicycles 6.30 group. I needed a brighter headlight. So I bought a Planet Bike Blaze headlight and Superflash rear light. Again as a set. The headlight and rear light were noticeably brighter that their Cateye equivalents. The only downside was that the headlight run-time on two AA batteries was only five hours at high output. In 2010 I bought my first road bike. A second downside of the Planet Bike headlight became obvious. The headlight and mount were bulky. This wasn’t a problem on my hybrid bike because my hands were usually on the handlebar extensions. On my road bike however the headlight took up space on my bars where I wanted to put my hands. So before long I bought another headlight. A Niterider MiNewt Mini-USB. The Niterider MiNewt had three advantages over the Planet Bike headlight. The MiNewt was one third the size of the Planet Bike. It could be mounted on my helmet, thus freeing up space on my handlebars. Lastly it was the first bike headlight that could be recharged via a USB port. I must admit that the separate light and external battery pack is not as convenient as an all-in-one unit. NiteRider do provide a velcro strap for attaching the battery pack to the stem or head tube. They also include a 1 meter / 39 inch extension cord so it is possible to ride with the battery pack in a jersey pocket. In 2011 I bought my second road bike. By then Niterider was selling the MiNewt Mini.150-USB. As the name implies, the output had increased to 150 lumens from the previous 110 lumens. There was also a flash mode. Best of all the run time was unchanged. Brighter being better, I bought one. 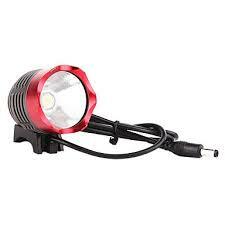 Note: Bicycle light manufacturers often use lumens as the measure of light their equipment produces. Some use candelas. A few use lux. Unfortunately there is no regulation or consistency in the bike light industry with respect to how light output is measured and reported. Caveat emptor applies. Light output is not the whole story either. The shape of the beam is a big determiner of the effectiveness of the light. A broad beam may not properly light the road or path ahead. A focused beam may light up close objects, or those farther away, but not both at the same time. Beam shape and pattern are a function of bulb angle and shape, reflector shape and lens shape. What is the current state of play as far as bicycle lights are concerned? Niterider sells the MiNewt Pro 750. It has five times the light output of my MiNewt Mini.150, four light levels and three flash modes. If you don’t want a light with a separate battery pack you can buy the Lumina 650. 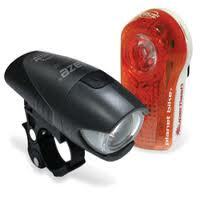 The Lumina 650 puts out more than four times the lumens of the Planet Bike Blaze, and it is rechargeable. Systems with external battery packs put out the most lumens. Chon’s headlight is an SSC-P7. It can pump out up to 1,200 lumens, though at the expense of run time. Chon tells me that the run time at 1,200 lumens is ridiculously short, so he runs his headlight at 600 lumens. Still plenty bright. What’s the brightest bicycle headlight on the market today? That seems to be the Lupine Betty R12. This light has a claimed output of 3,600 lumens. 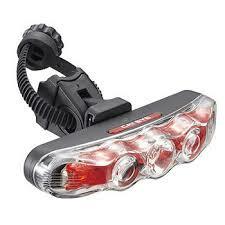 Better yet, in a review of LED bike lights, mtbr magazine measured the actual output of this light at 3,625 lumens. In comparison, the xenon bulbs used in High Intensity Discharge car headlamps (the ones with a bluish tint), produce about 3,000 lumens. As with all things top-end, the Lupine Betty R12 comes at a price. About USD930 / RM2,900 online. Finally, Mark’s rear light is a Cateye Rapid 5. The main LED looks to be just as bright as the one in the Planet Bike Superflash. However the Rapid 5 has five LEDs in all while the Superflash has three LEDS. The Rapid 5 has four modes. The Superflash has two modes. 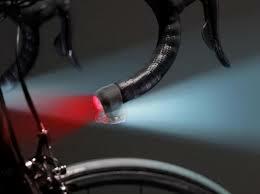 See what I mean about bike light evolution. I am tempted by the latest bright and flashy. I think I’ll stick with my MiNewt Mini.150 and Superflash. I am going to pull my Tacx Lumos lights out of storage tonight though. These mount in the handlebar drops. Each light has a white LED for forward lighting. There is a red LED for visibility from the rear. And there is a button-activated amber LED that is a turn-indicator. I don’t need no high-output headlights! * Title courtesy of Elton John and Bernie Taupin. Posted in Cycling in Malaysia and tagged Bicycle lighting, Cateye, Headlight, Houston, LED, Lumens, Lupine, NiteRider, Planet Bike, Rear light, Shah Alam Expressway, SSC, Tacx, West End Bicycles. Bookmark the permalink. My first BP MS150 ride was in 2010. 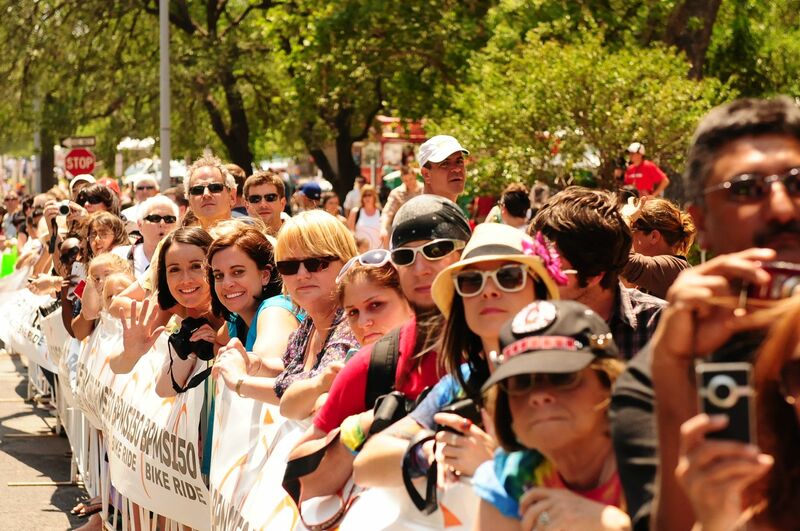 I wrote about that ride in Austin or Bust. I registered late for that ride and had to scramble to get onto a team. One outcome was that Tom and I didn’t get space in the team tent for the overnight stop at the Fayette County Fair Grounds in La Grange. Instead we stayed in a motel that was a 40 minute van trip away from the fair grounds. I am sure we were more comfortable on proper beds in our air-conditioned motel room than we would have been on camp beds in the team tent. Especially as it rained hard that night. However we paid for it by having to be up and ready to leave the motel at 5am to get back to the fair grounds in time to start with everyone else. 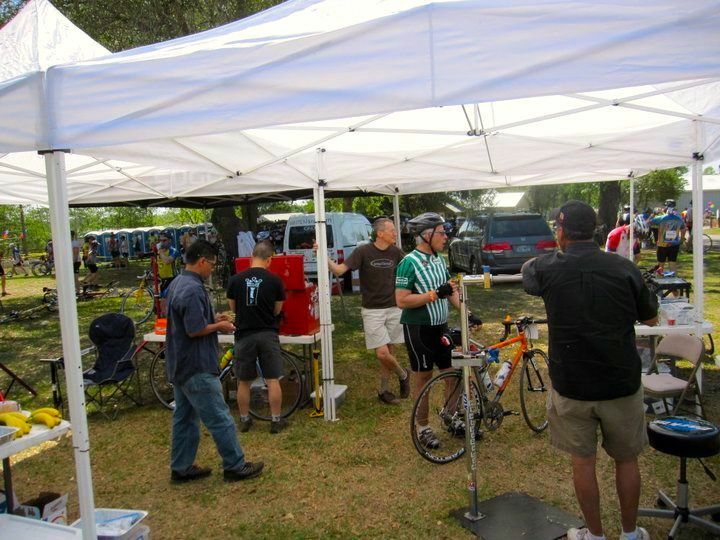 I signed up early for the 2011 BP MS150. By then I had moved to The Netherlands, and was no longer working for Hess Corporation. The team captains were kind enough to let me join the Hess team anyway. They were even nicer to allow friends of an ex-employee onto the team. So Barbara, Dane, Laura and Tom would be in Hess colors with me. I flew into Houston a few days before the start of the ride. I visited the new Hess office at Discovery Green and called in on Patrick Cummings, one of the team captains. 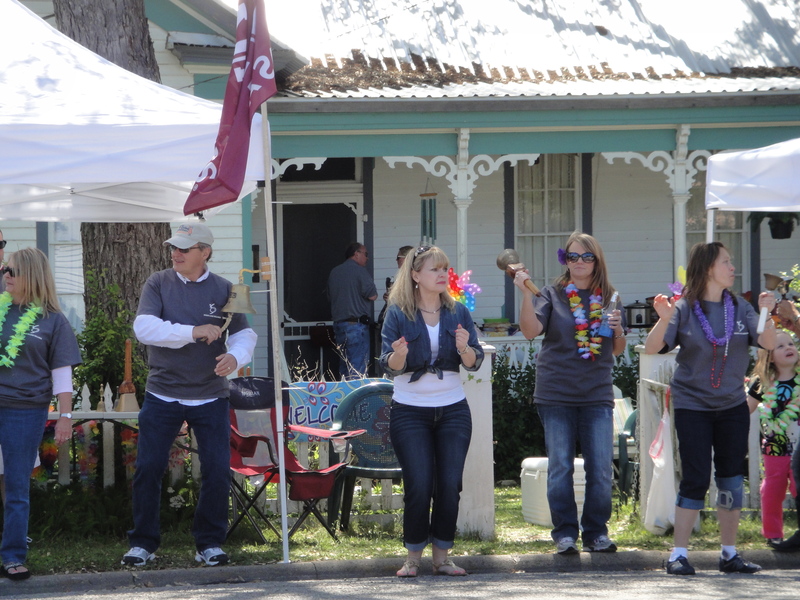 The first indication that this experience would be quite different from the previous year’s came when I heard that we would spend the night in the VFW Hall at the Fayette County Fair Grounds in La Grange. No tent pitched on grass for us! The ride started as it did the year before. 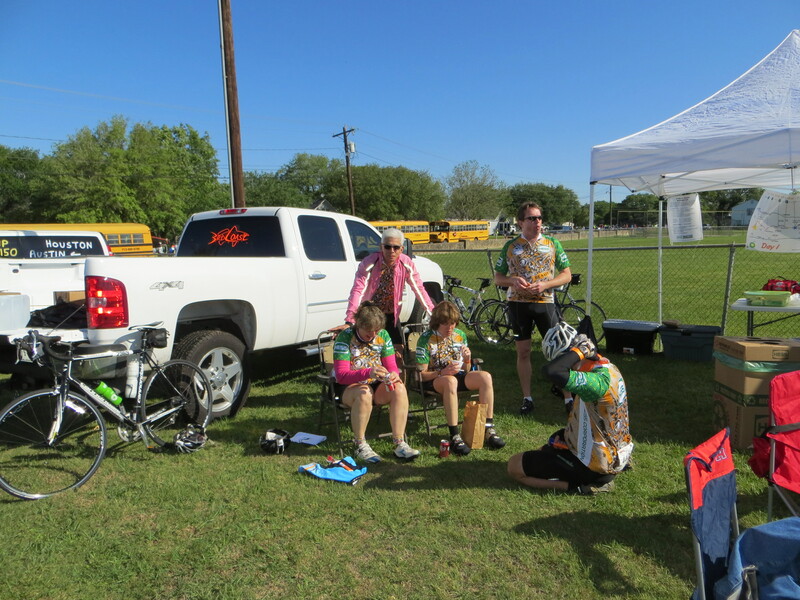 My West End friends and I rode out at dawn from the Jack Rhodes Memorial Stadium in Katy. Tom and I chose not to wear jackets so we shivered for an hour or so. By the time we got to the first rest stop it was warming up in the patches of sunlight. There were still some jackets and arm warmers in use though. Our lunch stop was in Bellville. 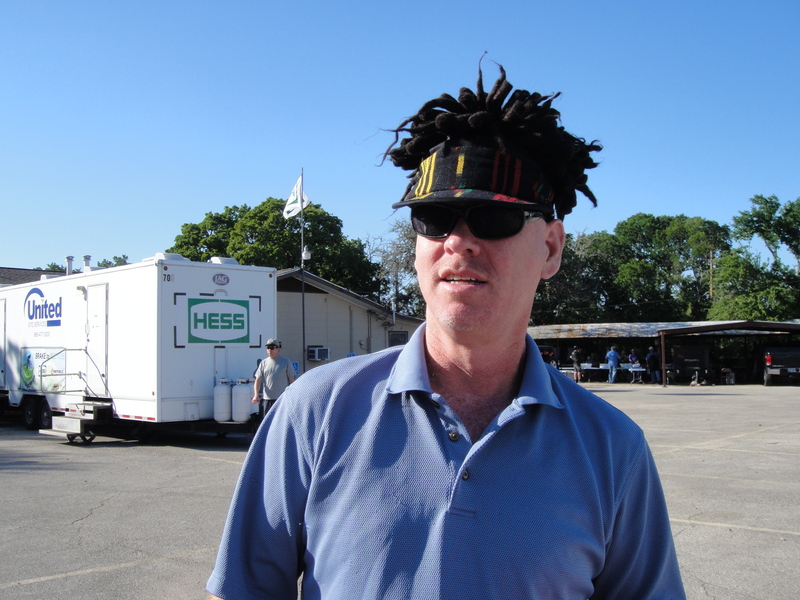 That was when I got the the second indication that the Hess team did the MS150 a little differently. There were Hess volunteers and a Hess tent at the lunch stop. We had an alternative to the sandwich lunch on offer for everyone else. The wonderful Hess volunteers were handing out chicken and spicy chicken sandwiches from Chick-A-Fil. And Snickers bars and iced drinks. This is Tom, Laura, Dane and I at the Bellville stop. The patch on Laura’s jersey signifies that this was her tenth consecutive BP MS150. Fantastic! One of the other stops before La Grange was at Industry. 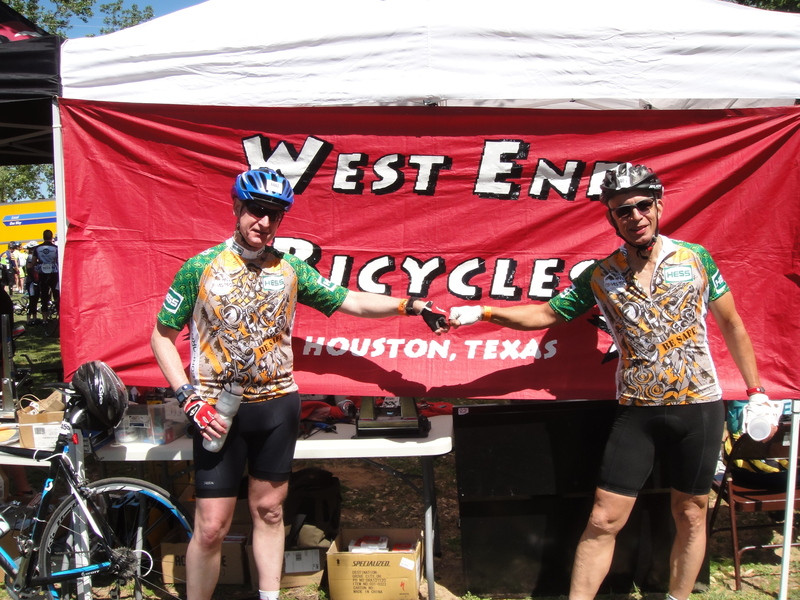 The guys from West End Bicycles were manning a bike service tent there. We hung out with Daniel and the team while we ate our bananas before continuing west. One of the most appealing things about this ride is the encouragement all the riders get from the communities along the route. It seems like entire towns turn out to cheer us on. And some do more than simply clap and wave. Laura, Barbara and the rest of the West end crew rode into the Fayette County Fair Grounds at La Grange at about 2pm. 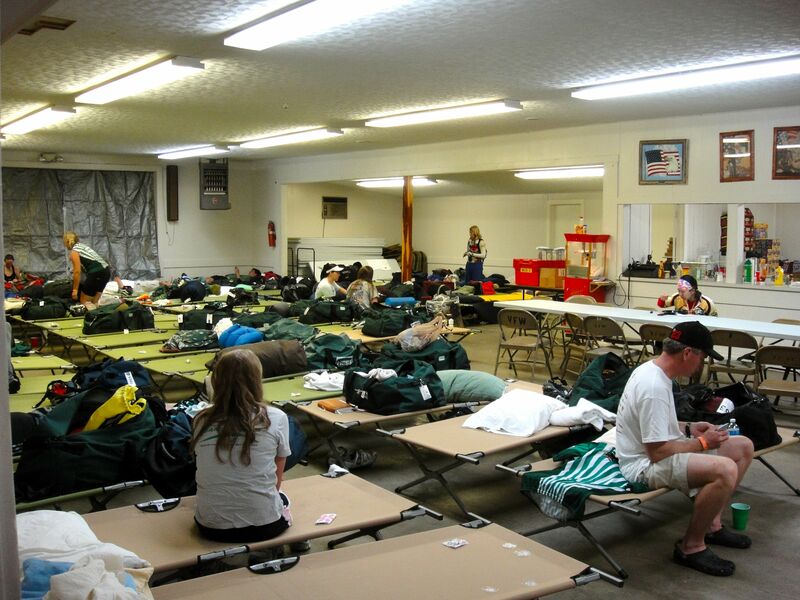 It was pretty hot by then, so we were grateful for the Hess volunteers who were on hand with cold water and iced towels as we got to the VFW Hall. That was, dare I say it, just the start of the pampering that we received at the overnight stop. In 2010 we queued for thirty minutes with everyone else for the communal shower trucks. In 2011 we lounged in folding chairs with a cold drink in hand while waiting for our turn in the Team Hess shower truck. 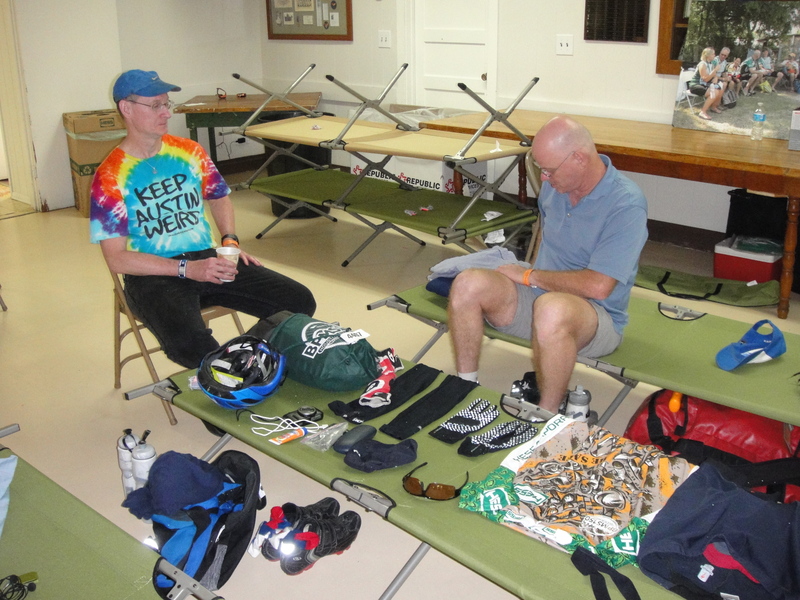 After which we handed our sweaty cycling gear to a friendly volunteer to be laundered. 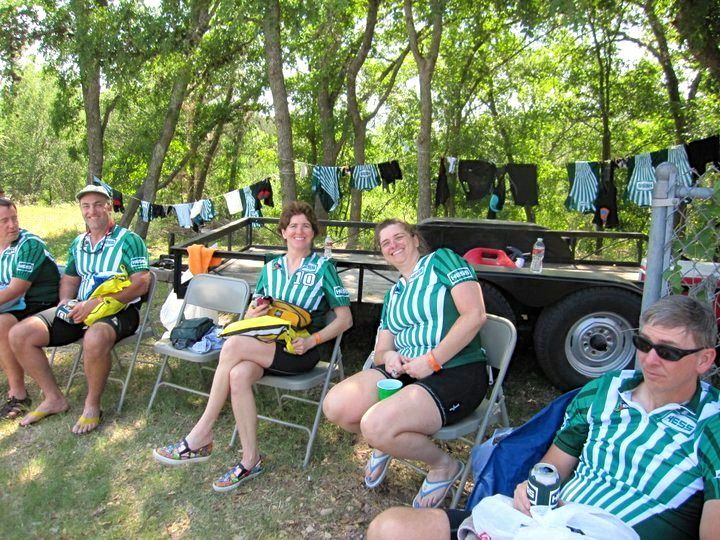 Note the jerseys drying on the line behind Laura and Barbara. Feeling a bit tight and sore despite the hot shower? Get a massage! We spent the rest of the afternoon waiting for our turn to be kneaded, and chilling with drinks and munchies on the patio behind the VFW Hall. We were eventually roused from our seats and coaxed into our freshly laundered jerseys for the obligatory group photo. Then it was dinner time. Courtesy of the crew manning this beast. 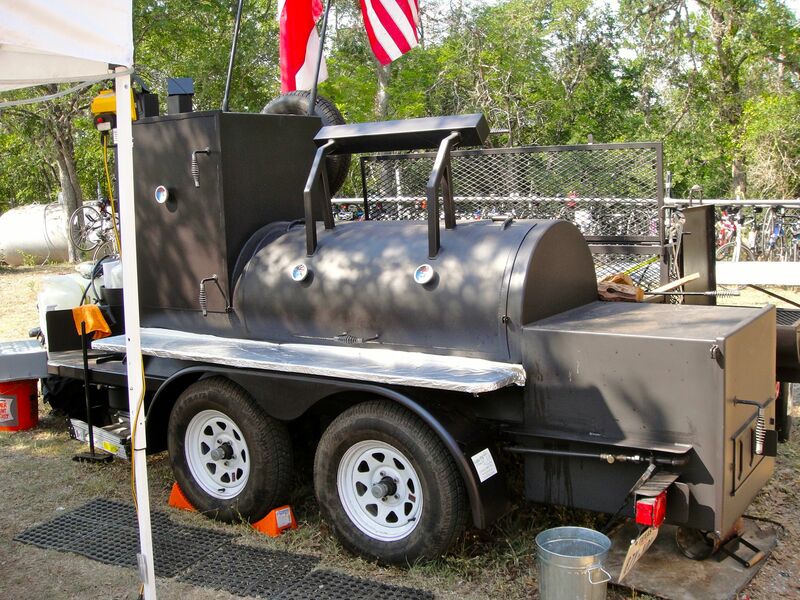 The barbecues come big in Texas! And the food that came out of this one was delicious. Well-watered and fed, we started thinking about sleep. As I mentioned earlier, no tent pitched on the grass for us. Air-conditioning and indoor toilets if you please. There was no excuse if you didn’t get a good night’s sleep. And there was no excuse if you weren’t well-fed by the time you got on your bike in the morning. 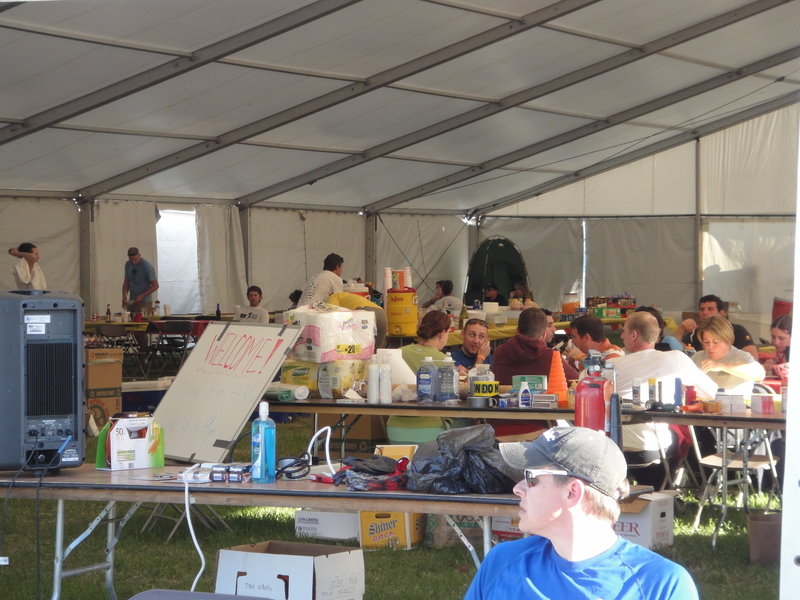 The Hess volunteers served up a delicious breakfast from the kitchen next to our sleeping area. 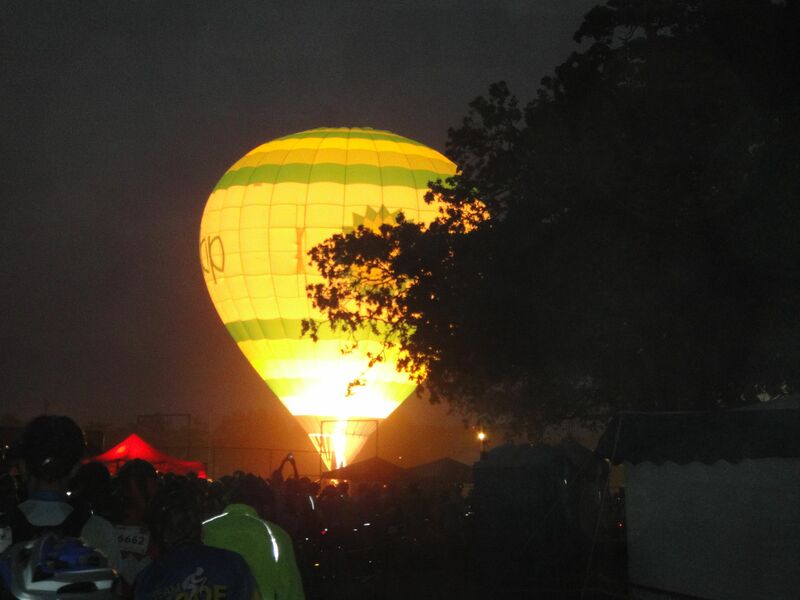 The BP balloon lit up the pre-dawn sky as we waited for it to get bright enough to continue on our way. The decision to be made at the start of Day Two was whether to take the Bechtel Challenge Route or the Pfizer Lunch Express. 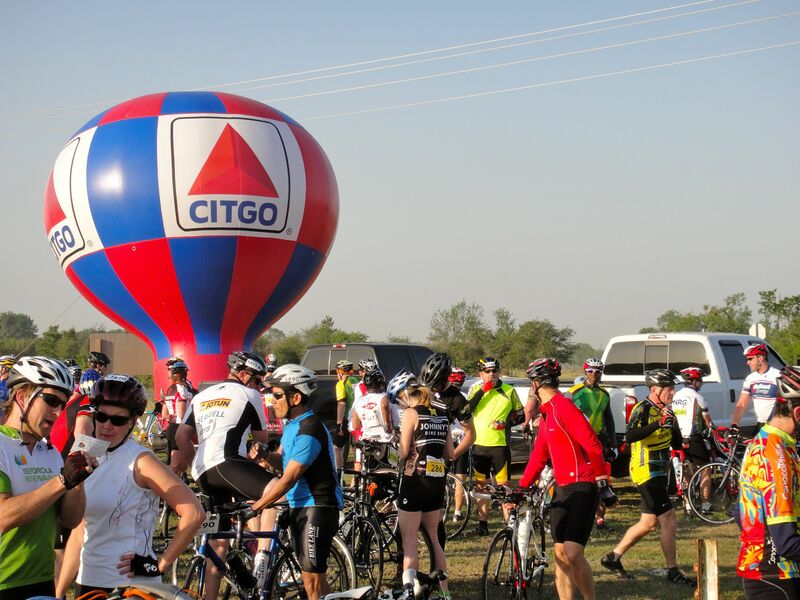 The Bechtel Challenge takes riders through Buescher State Park and Bastrop State Park. We chose not to take the Bechtel Challenge Route in 2010 because the hilly roads were wet and potentially dangerous. There were no such concerns this time. The Challenge adds about 17 km / 11 mi to the ride but it was well worth doing. 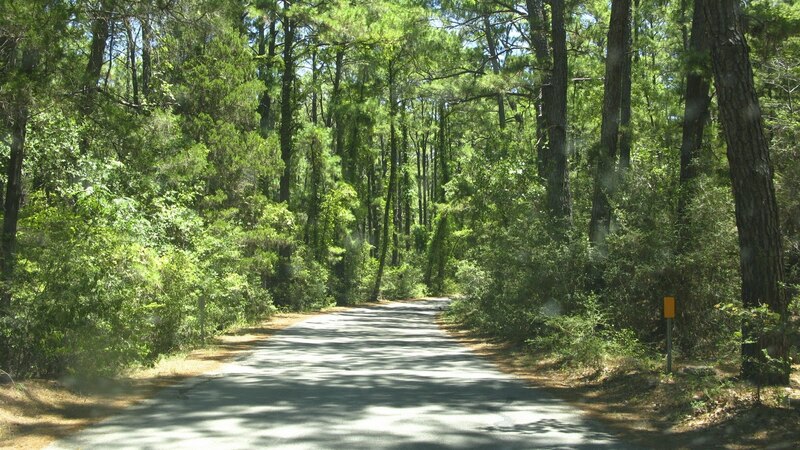 The road wound through scenic loblolly pine woodland that is 18,000 years old. 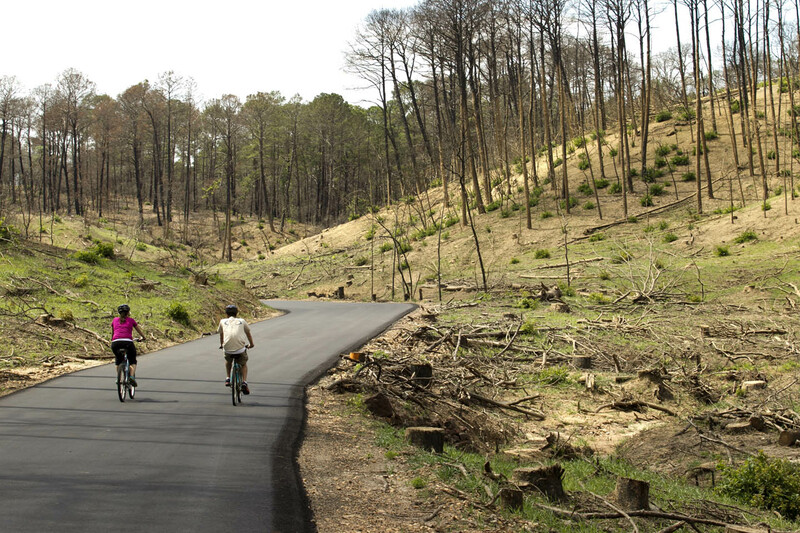 Sadly Bastrop State Park and the surrounding pine forest were the scene of a devastating wildfire in September and October 2011. This was one of the most destructive single wildfires in Texas history. Bastrop State Park suffered significant damage affecting 96% of the park. 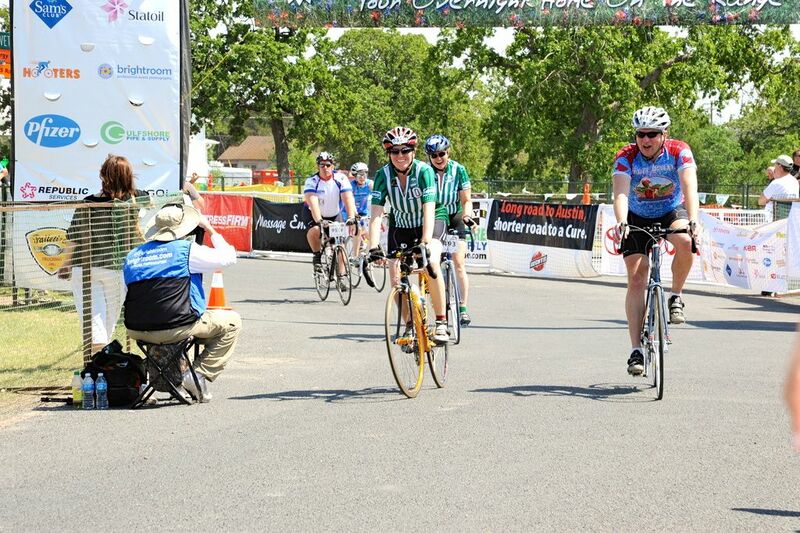 The Challenge route was not an option during the 2012 BP MS150. However I am happy to say that the road through the park has reopened, and weather permitting, we will ride the Challenge route again this year. Albeit through an altered landscape. We skipped the opportunity for even more pampering from the Hess volunteers at the lunch stop in Bastrop. We did the usual for the West End crew. No matter what team we were riding with, we congregated at the Whataburger for a burger, fries and a milkshake. 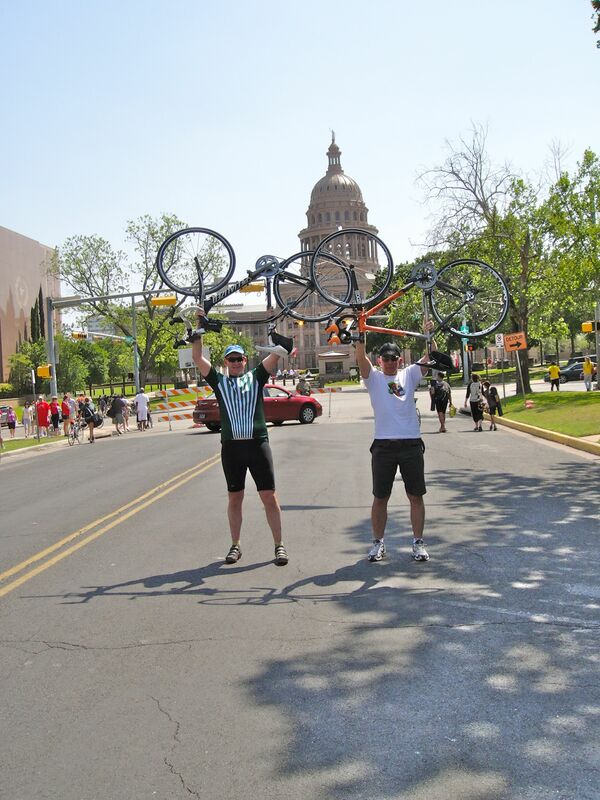 It was about 55 km / 34 mi from Bastrop to the finish line at the Bob Bullock Texas State History Museum. We made one last stop at the Moose Family Center of Austin. The Moose Lodge is about 5 km / 3 mi from the Texas State History Museum. A perfect place for the West End gang to regroup so we could roll through the finish together. Sophie and Alisa joined, Tom, Barbara and I. We missed connecting with Laura and Dane. They thought they were late getting to the Moose and had ridden on. It is quite a thrill to ride that last kilometer or so through spectators three and four deep on both sides of the road. We took advantage one last time of the superb care – read cold drinks and snacks – provided by the Hess volunteers at the finish. Then Tom and I headed toward the State Capitol. 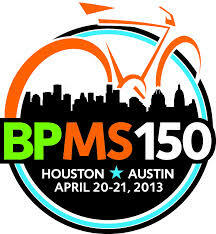 I am looking forward very much to my third BP MS150. It is going to be a treat to reconnect with my West End friends. Who like me have been spoiled by the Team Hess treatment in the past. Who like me can’t imagine riding the BP MS150 with any other team. And who like me are depending upon your generosity to raise as much as we can to put toward the search for a cure for multiple sclerosis. Posted in Cycling in Texas and tagged Austin, Bastrop, BP MS150, Fayette County Fair Grounds, Hess Corporation, Houston, Industry, La Grange, Multiple sclerosis, VFW, West End Bicycles. Bookmark the permalink.